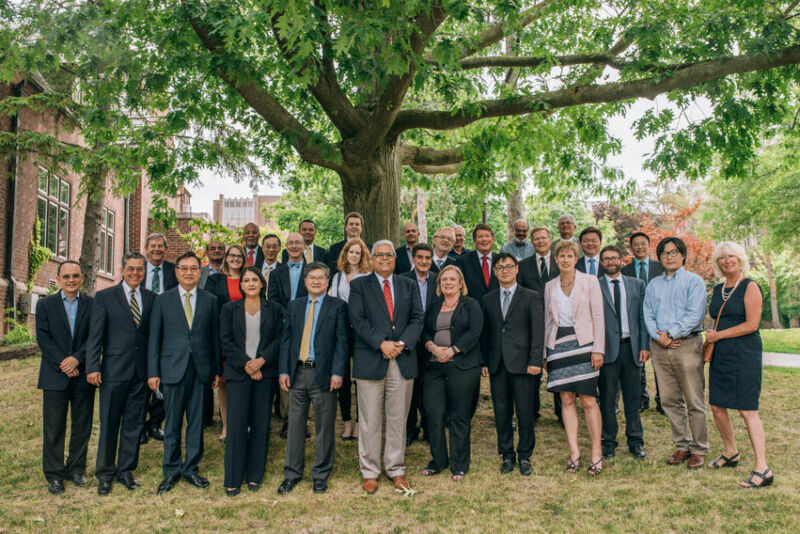 Engineering deans from around the globe came together at McMaster University to brainstorm ways to address climate change using innovative technology. The inaugural Carbon Free Innovation Network (CaFIN) event, hosted by the university’s Faculty of Engineering, brought together academics, industry experts and government officials on July 6 to explore challenges to reducing carbon emissions; pathways to creating a carbon-neutral economy; and how to better incorporate green technology approaches into engineering education. A declaration was signed between the engineering deans of McMaster University, Illinois Institute of Technology, the University of Notre Dame, Seoul National University, University of Hong Kong and leaders from the Global Engineering Deans Council (GEDC) to pledge their commitment to developing carbon neutral innovations, spurring local and national economies as a result and improving the well-being of nations. The GEDC is an international organization whose members are top engineering academic leaders from around the world. More than 500 deans belong to the council representing more than 30 countries from all continents. McMaster is hosting the organization’s annual conference in October 2017. Several experts spoke throughout the day-long CaFIN event, including engineering academics, representatives from global consulting engineering company Hatch, ArcelorMittal Dofasco, the Ontario Centres of Excellence and the Mayor of Burlington Rick Goldring. Engineering deans from around the globe came together at McMaster University to brainstorm ways to address climate change using innovative technology. The inaugural Carbon Free Innovation Network (CaFIN) event, hosted by the university’s Faculty of Engineering, brought together academics, industry experts and government officials on July 6 to explore challenges to reducing carbon emissions; pathways to creating a carbon-neutral economy; and how to better incorporate green technology approaches into engineering education. “Climate change impacts every country on the planet and is diminishing human and societal health and prosperity and will worsen without intervention,” says Ishwar K. Puri, McMaster’s Dean of Engineering. “As members of the global engineering community, we need to accept our responsibility for developing carbon neutral solutions for the betterment of humanity.” A declaration was signed between the engineering deans of McMaster University, Illinois Institute of Technology, the University of Notre Dame, Seoul National University, University of Hong Kong and leaders from the Global Engineering Deans Council (GEDC) to pledge their commitment to developing carbon neutral innovations, spurring local and national economies as a result and improving the well-being of nations. “We need more urgent actions on climate change from technical leaders around the world,” said Peter Kilpatrick, Matthew H. McCloskey Dean of the College of Engineering at the University of Notre Dame and Chair of the GEDC. “I’m delighted that the deans of engineering from these four countries and five universities came together today to go on record and commit to research and education that would impact climate change.” The GEDC is an international organization whose members are top engineering academic leaders from around the world. More than 500 deans belong to the council representing more than 30 countries from all continents. McMaster is hosting the organization’s annual conference in October 2017. Several experts spoke throughout the day-long CaFIN event, including engineering academics, representatives from global consulting engineering company Hatch, ArcelorMittal Dofasco, the Ontario Centres of Excellence and the Mayor of Burlington Rick Goldring.